Equine behavior is fascinating. We become better horsemen who can communicate with, ride, and train our horses, mules, and donkeys more easily and with less stress when we understand their behavior. If you don't understand what your equine's behavior means, then	your training program may be ineffective at best. At worst, you could be seriously injured. 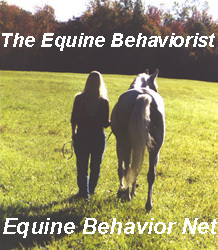 So few horsepeople really understand the behavior of their horses, but Equine Behavior Net's goal is to change that. The Equine Behaviorist is dedicated to providing you with helpful information on the behavior of equines - including horses, ponies, mules, and donkeys. The Equine Behaviorists' first book, How to Start and Run a Rescue is now available for purchase. The book includes information on how to set up and run an animal rescue or other animal-related non-profit as well as stories about rescued horses. Learn more. (C) 2005-2010 Jennifer Williams. All rights reserved.